"Bill, Thanks for the piano and harp tracks. I did a little editing and mixed them in with the other tracks and it sounds fantastic!" Why order from us? 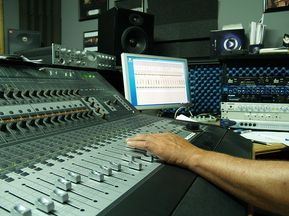 We have proven pro quality session players, playing on a professional quality instrument through quality gear, including expensive instrument-specific microphones, pre-amps and compressors. Accordion players around the country offer tracks over the Internet. But they will likely not be professional session musicians and the results just might make you realize why cousins shouldn't marry...does Deliverance ring a bell? *Regular rate is $95 per track, 3 song minimum. But we have songs already scheduled to record. Order NOW and the price is $95 per track with no minimum number of songs! It's so EZ to add an harmonica track, played by a Nashville professional session quality player, to your home or studio recording project, right over the Internet! Step 1: Make an mp3 stereo mix of your project and send it to nashtrax@bellsouth.net. A vocal, panned low in the mix, just audible, is extremely helpful as well. Step 2: e-mail the MP3 mix to nashtrax@bellsouth.net along with any notes. For $95 you'll receive one harmonica part. Two songs, both needing accordion? Only $170. Three or more? Only $75 each!